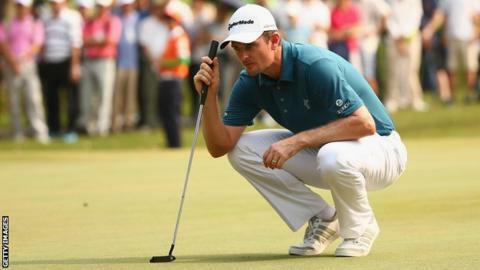 Justin Rose and Lucas Bjerregaard share the lead on 15 under par at the Hong Kong Open after a gripping third round. Englishman Rose began the day with a one-shot lead and carded two eagles and two birdies for a six-under 64. But his playing partner Bjerregaard went one better with a 63, marred only by a bogey on the 18th that denied the Dane an outright lead. England's Ian Poulter hit six bogeys in a three-over round of 73 that left him 11 shots off the lead. Poulter, who made a last-minute journey from Orlando to play this week and maintain his European Tour membership, saw his chances of victory disappear with three bogeys in his last five holes. Rose and Bjerregaard are four shots clear of third-placed Anirban Lahiri, of India. A shot further back on ten under are India's Jeev Milkha Singh and England's Matt Fitzpatrick, whose four-under round featured five birdies. The 21-year-old, who won the British Masters at Woburn a fortnight ago, had raced to the turn in 30 but also dropped his only shot of the day on the last in a round of 66. Rose, who started the day nine under after rounds of 65 and 66, hit a wild drive on the first hole and had to putt from 15 feet for par. The 35-year-old then hit form on the par-five third with a drive of more than 350 yards and an excellent approach setting up an eagle chance that he converted from 25 feet. Rose briefly enjoyed a two-shot lead until Bjerregaard, who had birdied the third, also picked up a shot on the fourth. The Dane took a share of the lead after a tap-in birdie on the sixth and matching Rose's birdie on the 10th. Further birdies on the 11th and 12th took Bjerregaard two clear and the 24-year-old made it four in a row on the par-five 13th, but still saw his lead cut in half as Rose holed from 50 feet for his second eagle of the day. Rose birdied on the 14th before Bjerregaard retook the lead on the 16th, only to drop his only shot of the day on the last after his approach shot edged into the rough at the back of the green.